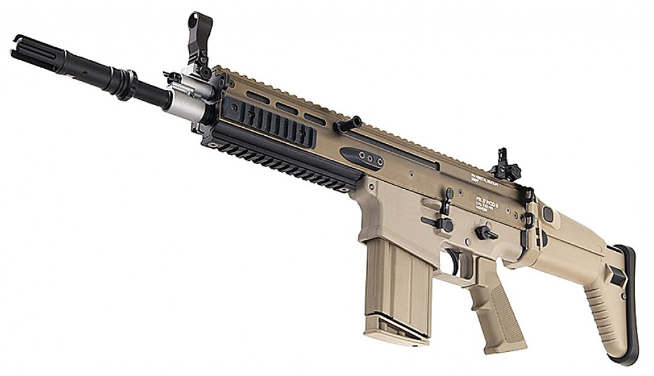 The Special Operation Combat Assault Rifle (abbreviated SCAR) is a family of firearms designed and developed by FN Hertsal of Belgium, and manufactured in FN’s United States facilities for the U.S. Army’s Special Operations Command (SOCOM). This series of weapons operates by gas, and is self-loading. 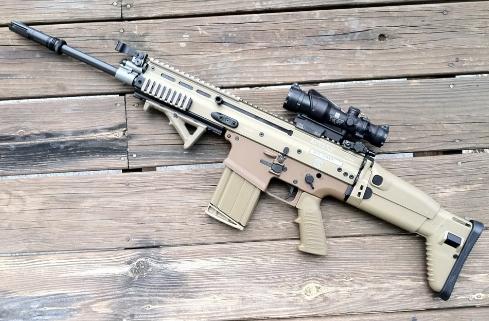 FN Herstal have been around since the end of the 19th century – we’ll cover its history and more here in our FN Scar Rifle Overview and Review. 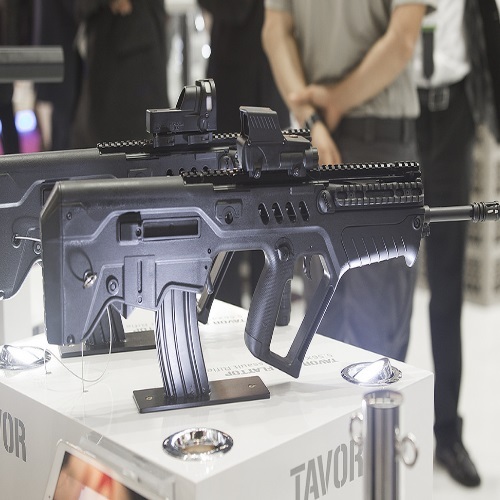 FN started off manufacturing weapons at the behest of the Belgian authorities, and quickly acquired worldwide recognition for their innovative designs and ingenuity. They even partnered up with John M. Browning, until his death. Browning’s designs and ideas are still being used by the company today, and FN keep on releasing firearms which set the standard for excellence and ingenuity. Their weapons have seen tours, battles, and confrontations of all kinds, and their team of engineers is considered one of the best in the world, bar none. They have gained the respect of combat soldiers from all corners of the earth, and for good reason (check out the Five-seveN for an excellent example of their quality). In 2003, SOCOM requested a new kind of combat rifle. The new rifle was to be made available in different calibers, and be specifically tailored to the needs of Special Forces and other units. One year later, it was announced that FN was going to be manufacturing and delivering firearms to the U.S. Army, beginning in 2009. It was believed that the FN SCAR series is meant to replace many of the current rifles which are being used by those units. Rifles like the M16 and M4 are being phased out gradually, and other ones are being brought in. The SCAR was chosen for its light weight, its adaptability, its accuracy, and its modular design. The idea behind the SCAR’s design was that in battle conditions, a fighter needs to have the ability to change a weapon’s configuration, and fast, in order to adapt to a constantly-altering battlefield. With the SCAR, fighters have a way of changing stocks, barrels, sights, and many other key elements of their weapon in minutes. You take cover, have your friends lock down the enemy with covering fire, and do what needs to be done, before re-entering the fight with renewed purpose. This is crucial, especially for those who are operating behind enemy lines. No matter what kind of intel you may have on the current mission, every combat soldier knows that the field is a place where things can change in a matter of seconds. A combat soldier’s best friends are his weapon and his brothers in arms. A soldier’s personal weapon needs to serve in the best way possible, which is why the SCAR rifles were chosen out of many other makes and models. SCAR SSR Mk 20 Mod 0 – sniper support rifle, which also uses 7.62X51mm rounds. Provides long range precision, and comes in two variants: the first is the SSR, which has a 1,000 meter effective range, and an overall length of 42.5 inches. Collapsible to 40.5 inches. The SSR has a 20 inch barrel, and weighs 10.8 lb. The second is the SCR, which has a range of 800 meters, and is 40.1 inches long, overall. Collapsible to 35.9 inches. Both of these sniper rifles are semi-automatic, with a rotating bolt. They feature ambidextrous selectors, ambidextrous magazine releases, and a charging handle that can be mounted on either side. These rifles can also be used with a suppressor, and they are equipped with a flash hider. The barrel can be removed or replaced by the weapon’s operator, which makes it more compact. The stock is non-folding, but there is the option of adjusting the length of pull without any tools. 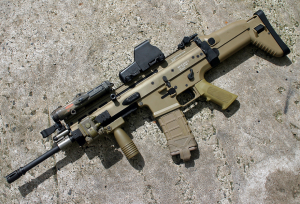 SCAR 16S – Semi-automatic, chambered in 5.56X45mm, 16.25-inch barrel, 30-round magazine (10, where jurisdiction allows). SCAR 17S – Semi-automatic, chambered in 7.62X51mm, 16.25-inch barrel, 20-round magazine (10, where jurisdiction allows). 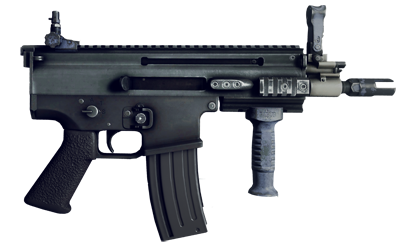 SCAR 20S – Semi-automatic, chambered in 7.62X51mm, 20-inch barrel, 10-round magazine (may be restricted in some states). 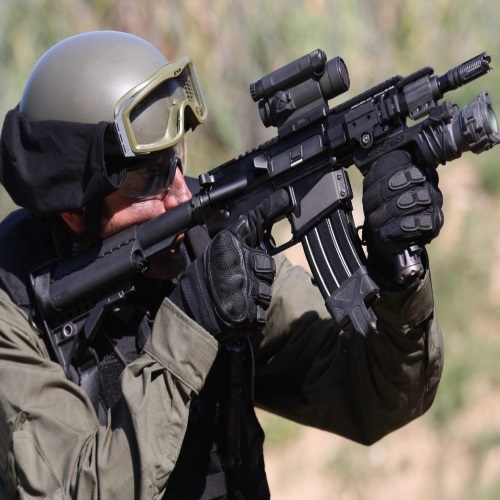 The SCAR weapons system began its production in 2004. It joined the arsenals of various military organizations in 2009, and is still being produced and used today by the armed forces of over 20 countries, including Belgium, France, Germany, India, and Turkey. 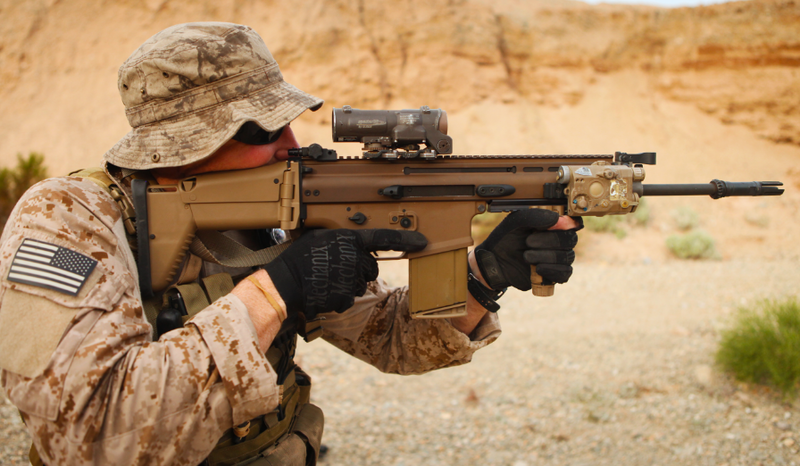 The U.S. Armed Forces have also accepted some of the SCAR weapons, and still continues to use them today. 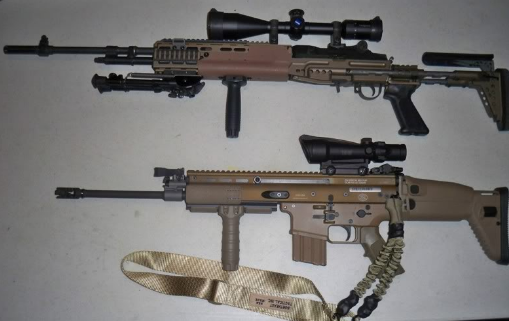 SCAR rifles are also famously used by the Los Angeles Police Department SWAT teams, and by various government agencies. The 5.56mm SCAR rifles’ magazines are compatible with the M4 / M16 magazines, and are made of steel with an extended base pad. The 7.62mm SCAR rifles’ magazines are compatible with AK-47 / AKM magazines, and are able to fire the AK’s 7.62mm rounds. Again, very important for those who may be operating in areas with hostile forces. The AK is one of the most commonly-used weapons in the world, and having the ability fire the AK’s magazines and rounds from the soldier’s personal weapon is a significant advantage. Let’s go a little bit more in depth, with a review of two of the most popular SCAR rifles, the Mk 16 and Mk 17, in their standard configuration. Stepping up to replace the famous M16 and M4 rifles is no easy task. Not by a long shot. Those two models (and their many variants) have been with the U.S. Armed Forces for a very long time. Ever since the Vietnam War, the M16 and its variants have been serving the United States Army, Navy, Marines, and Air Force units all over the globe. They have been used – and are still used – by many militaries, governments, and police departments. So, when the United States Department of Defense asked companies to come up with anew kind of rifle, every arms manufacturer knew that they had to bring their ‘A game’ to this challenge. 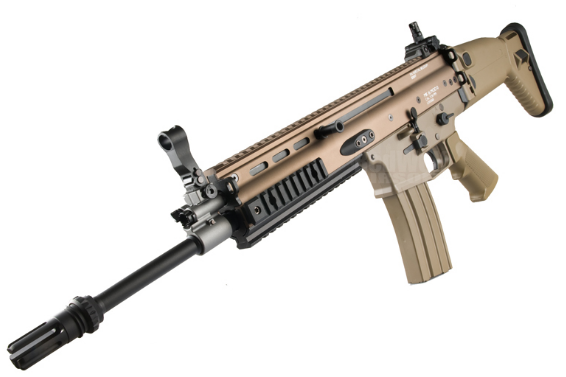 FN Herstal’s SCAR Mk16 sports a compact design, select fire feature, telescopic side-folding stock, ambidextrous selector switch, ambidextrous magazine release, 4-sided picatinny rail, large trigger guard (perfect for gloved access), flash hider, and its barrels have the ability to be used with a suppressor. As mentioned, its magazines are compatible with M4 / M16 magazines, making it ideal for the U.S. Military’s needs. As we know, we can’t all get our hands on a military-grade weapon. Thankfully, FN has also released the 16S, which is the civilian version. As mentioned, it is a semi-auto model, and it has a MSRP of $2,995. That makes it one of the most expensive 5.56mm semi-auto assault rifles out there, but it beats the crap of the civilian AR-15 platform. And you know that means something, because the AR-15 platform is a great one, by any standards. The SCAR 16S’s recoil is one of the softest there is, and it is noticeably less jumpy than the AR-15’s recoil, which is already pretty low (depending on your model). The SCAR’s engineering makes it so the recoil is spread out more evenly, and at times it is barely there at all. However, it is a lot louder than the AR-15, so head’s up. Like its military counterpart, the SCAR 16S features an adjustable and side-folding stock, along with an adjustable cheek-piece. The grip is A2 style, and the controls are ambidextrous. Enlarged trigger guard, right- or left-sided charging handle, and picatinny rails at four sides. What more do you need? Unless of course you are more interested in our next rifle… and who could blame you? Using a heavier and more serious caliber like the 7.62mm requires a rifle that can handle it. The SCAR-H 17 is a monster, regardless of the barrel you are firing with. The 7.62 round offers much greater penetration capabilities, which is why the SCAR-H is a designated battle rifle. The civilian version, SCAR 17S, is similar to the 16S in many ways. Those two models share many similarities in their respective versions, which is part of what makes them such a desirable weapon system. Looking for fire power? durability? long range accuracy? You got it. This thing has ambidextrous controls, picatinny rails on all sides, and is built for winning. It is ideal for heavy 3-gun matches, which are becoming more popular by the minute here in the U.S. The MSRP for this beast is $3,349. It is expensive, but if you can afford it, there is no topping this thing’s quality, reliability, and versatility. 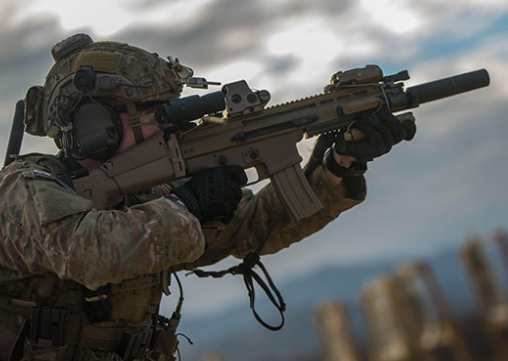 The U.S. Armed Forces are reportedly getting rid of their SCAR Mk 16 rifles slowly, and are replacing them all with SCAR Mk 17 models. The SCAR-H 17S features an adjustable and side-folding stock, along with an adjustable cheek-piece, just like the 16S. The grip is A2 style, and you can shoot it from any position, and hit that target. 7.62mm ammo is loud and effective. If you are into obliterating everything in your path (and hey, who isn’t?) 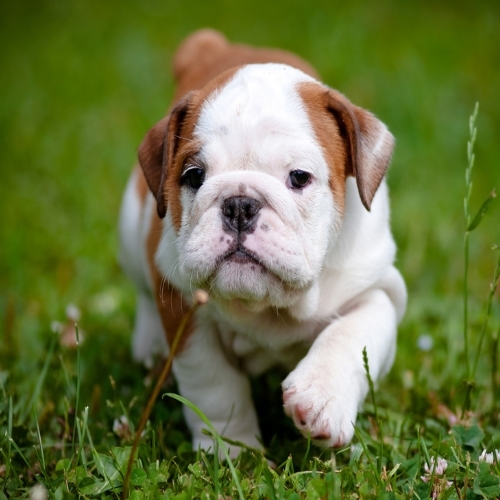 then this is the one for you. Again, if you can afford it – do it. One thing about weapons is, you can always improve them. The factory materials of the SCAR series are excellent, but some of them could still stand to be replaced, if you are so inclined. From replacing factory-made parts, to adding lights, lasers, scopes, and bi-pods – here are a few accessories which you may want to get your hands on. Sling attachment / Sling – The SCAR series may be relatively lightweight, but after carrying it for a while, the rifle can get heavy. You need a sling and a sling attachment, whether you are military, law-enforcement, or a civilian. You need to have use of both hands, and it is one of the first – if not the first – accessory you should get. Stock Latch – The original SCAR stock folding latch is made of plastic, and there are others around which are made from aluminum or other materials. They are sturdier and will probably last much longer. Plastic breaks a lot easier, and a broken stock could render your rifle nearly-useless (in most cases, anyway). 45-Degree Sights – Not a must, but definitely an improvement. The sights which come with the SCAR are great, but if you are using any kind of long-range optic, the 45-degree angle sights make a big difference. Battle readiness is above all, and the transition sights make you that much more prepared for any scenario. 45-degree Mini-Rail – A 45-degree rail allows you to install accessories in unconventional ways, which is perfect if you are looking to truly personalize your weapon. It is not for everyone, but still worth mentioning in conjunction with the transition sights. Foregrip / Bi-Pod – In a word, stability. In two words, improved stability. The low recoil of the SCAR series already offers a great deal of balance, as well as amazing accuracy on initial and follow-up shots. With the installation of a foregrip or bi-pod, you will be able to get even more out of this already exceptionally-built firearm. Optics – These, like all other accessories, are based purely on your personal needs. Short range, long range, whatever it is, there is an optic for it. Obviously, you probably wouldn’t want to place a cheap product on such an expensive piece of weaponry, but it is up to you. The picatinny rails accept all kinds of tactical flashlights, green or red lasers, red dot sights, magnifiers, scopes of varying lenses, and pretty much anything out there which is built to improve your aim. Is there anything else left to say? For the third and final time: if you can afford it, get it. The SCAR series is a family of uncompromising weapons, and any shooter will be exceedingly happy with their performance. FN Herstal’s limited warranty is for life, and if you take good care of your firearms, there is no reason why this rifle won’t last a lifetime. A great buy, and a wonderful addition to anyone’s collection. People trust the SCAR, from the men and women operating behind enemy lines, to their civilian brothers and sisters back home. Thanks for reading – check back for more on great brands line FN Herstal and Kel-Tec here at Gunivore!